Pharmaceutical products, similar to their packages, must meet the most rigorous control requirements. Legibility and compliance of content and colours against the registered packaging design is crucial. These requirements, as they relate to labels, also involve the use of substrates that are dedicated to the specific conditions of substance use by end users. This obligates label manufacturers to meet the highest quality standards. ‘handle’ labels – used in hospitals for suspending pharmacological liquid pouches. Our pharmaceutical customers’ audit results show compliance with the highest standards. 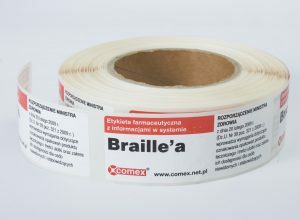 We supply Braille labels and booklets to Polish and international pharmaceutical companies.